Have you ever thought to yourself, "You know what would be really cool? What if when I'm hanging with my hipster friends later, eating fried chicken in the park, we could immediately print out photos of our fun times together!"? If this sounds like something you'd do, well, KFC Canada and agency Grip Limited have just the novelty for you! 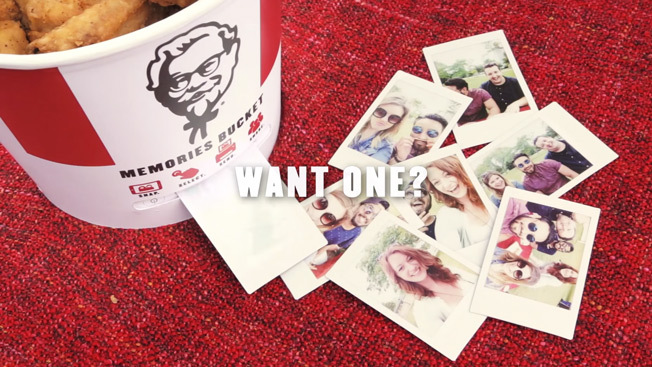 Introducing the "Memories Bucket"—a KFC bucket filled with chicken that pairs with your phone and prints out pictures. Agency copywriter Jeff Collins and social content strategist Matthew Stasoff tell AdFreak that the idea for the Memories Bucket came about while they were working on the campaign for the brand's 60th anniversary in Canada. The campaign is all about "celebrating 60 years of memories in Canada, one meal at a time." "Many fans have told us that throughout the years, so many of their family memories have been celebrated around a KFC bucket," Collins and Stasoff said in an email. "But when we looked at our newest generation of fans and thought about how their memories are shared today, we realized that so many are stored on phones and online, and very few are tangible. We started thinking of ways to offer them the same sort of physical memories their parents might have had, but in a way more relevant to them." They said they produced "multiple prototypes" to get the bucket right, but just one bucket was made for the shoot "with some fans of the brand." But maybe someday soon they'll be available to the public—and you can realize your dream of changing the photo paper cartridge and troubleshooting your phone's Bluetooth settings after wiping your fingers off on your jorts because you forgot the wet naps. "Inherently our buckets are much better when they're filled with our world famous chicken," Collins and Stasoff said. "So we're currently looking to work with some franchise owners to facilitate surprise and delight deliveries of the Memories Buckets to some of our more passionate fans."